The company said it would close the North Albany store by the end of next month. It’s always sad when a store you like has to close. You go in under the big “closing” sign, and the shelves don’t seem as full as they were. Some services are no longer being offered. Your rewards card no longer counts for anything. They offer discounts on the goods they sell, but what good is a discount if soon the doors will be shut? It’s depressing. And the worst part is that employees you have come to know by name — and like — have to look for work in an economy where jobs are hard to find. Ray’s Food Place in North Albany is closing. It’s one of the 16 stores the Brookings-based C&K chain of supermarkets is shutting down as part of reorganizing under Chapter 11 of the bankruptcy laws. The North Albany store was beautifully appointed when it opened in 2006, but it proved bigger than its market could support. When it opened, plans were in the works for building scores of townhouses in the immediate vicinity, along with big new subdivisions. 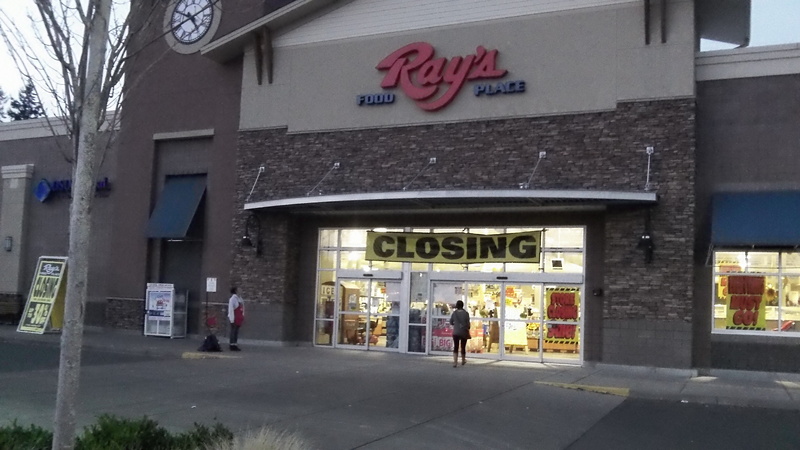 The townhouse plan evaporated, all those nearby residents who would have been able to walk to the store failed to materialize, and to some potential customers, Ray’s prices likely outweighed its convenience and friendly service. I’m no longer sure of the number, but from the very first grocery store built in that location, going back at least two or three decades, this will be at least the seventh or eighth that has failed…every single one. Years ago, the perception was that N. Albany didn’t have a sufficient population base to support a grocery store. That’s no longer the case. Why would Ray’s fail to do enough business to survive, in an era when it’s surrounded by a huge population that should, if anything, be able to make it thrive? It’s by far the nicest store in a long parade of failures, superb bakery and meat depts. excellent selections, Super friendly staff and ancillary services, including movie rentals, banking, pharmacy, and more. Sure, it’s not a mega-store, so prices were a bit higher. Could it be why too many N. Albany residents preferred to drive across the bridge to save a dollar or two? (while spending more than what they saved on the extra fuel their trip wasted?) Could all these failures have been prevented by N. Albany shoppers being loyal to their neighborhood store in return for the convenience of having it nearby? We’ll never know for sure. As far as remember, there have been only two supermarkets in North Albany since 1977. Carters’ operated successfully. The owners sold it when they moved to central Oregon. The buyers operated it along with a store in Monmouth until both closed. After standing empty for some time, the North Albany store became Tom’s Garden Center. 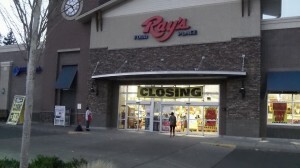 Ray’s opened in the then-new North Albany Village shopping center in 2006. While I am not sure about the numbers, Sam does have a point. It is not something that is unique to North Albany though in this economy. Besides the Carter family I remember two specific operators at the old facility. They were the Market Place which also had a store in Independence and after them it was a Thriftway. As I understand it, both used successful operations elsewhere to prop up the North Albany store. Success is all in the eye of the beholder. From the consumers prospective as long as the doors are open, the place is clean and it has what you need it would be viewed as a success. The operators of said store would define success a different way and in that regard the grocery store business in North Albany has been a struggle for 35 years. The challenges today are much different than they were for the Carters when they opened the store mare than 40 years ago. Someone will move into at least part of the Ray’s space and operate there it is just a matter of when and what that operation looks like. I wouldn’t be surprised to see Roth’s go in there if they could cut a good enough deal with the landlord.